Elk roam the Hardware Ranch Wildlife Management Area east of Hyrum, Utah. There are also several elk herds living in Tooele County. There is a large elk population in Tooele County, but it wasn’t always that way. Like the buffalo and antelope, they were slaughtered by so-called sport hunters in the late 1800s and early 1900s. In fact, elk or “Wapiti” as the American Indians called them, were completely wiped out in Utah and had to be reintroduced in the early 1900s. The Utah Department of Wildlife Resources (DWR) has done a masterful job of reintroducing elk to dozens of locations around the state. The elk population in Utah is estimated to be more than 60,000. Wapiti means “White Rump,” as elk are a brownish/buckskin-colored animal with a characteristic white rump. There are several locations in Tooele County and adjacent areas where I have observed them. There are large herds in the Oquirrh Mountains. 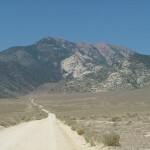 They range from Black Rock Canyon on Rio Tinto lands at the north end of the range to the high peaks above Ophir. 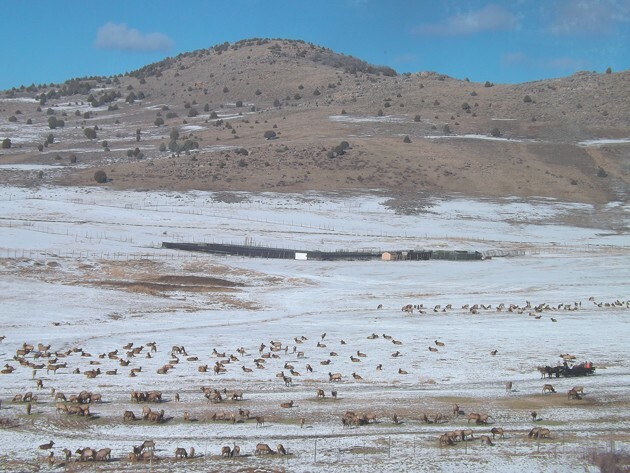 Due to heavy winter snows in these mountains, elk migrate down to the valley fringe areas to find grasses and shrubs to eat. Historically, elk utilized vast areas in our valleys for winter range, but urban sprawl has destroyed them. Elk can sometimes be seen near Copperton on the east side of the Oquirrh Mountains, and also in Rush Valley, and along the Mormon Trail during winter. There is also a small herd of elk that have made a home in the north Stansbury Mountains west of Grantsville. Once, while hiking in the Oquirrh Mountains near Lowe Peak, I saw a massive bull elk and several cows walk through a high mountain pass. It was a stunning sight to watch them slowly make their way through the mountain notch, browsing as they went with the bull often raising his head and large antlers to scan for danger. Property owners often get annoyed with elk because they compete with livestock and cause damage. Elk management is not an easy task, especially with limited resources. 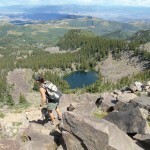 Hopefully a balance can be maintained to preserve both the elk and private property. To gain a better appreciation for elk, I researched information provided by the state’s Department of Natural Resources, in particular, “The Wildlife Notebook Series No. 12 on the Rocky Mountain Elk” by Amy Adams. I also took my family to the Hardware Ranch Wildlife Management Area east of Hyrum, Utah, which is owned and operated by the DWR. There are nearly a dozen informational panels on elk at the ranch with additional interpretative displays available in the visitor’s center. Those resources provided the following information. First of all, Rocky Mountain Elk, which are the type of animal that roams the mountains of Tooele County, are actually members of the deer family. A mature bull elk can weigh up to 700 pounds, stand 5 feet tall at the shoulder and have a body length of 8 feet from snout to rump. They also have a large rack of antlers that typically have six points on either side and unlike horns, are shed and regrown every year. It is hard to imagine these large antlers growing from nubs to full-blown racks in one season. As the antlers grow, they are covered with soft velvet. This velvet is shed over the summer or rubbed off on trees. According to the Rocky Mountain Elk Foundation, fully grown antlers are solid bone and can weigh up to 40 pounds. Imagine carrying that around on your head! 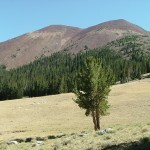 I can attest to antlers’ heavy weight, since one of my favorite mountain activities is to hunt for elk sheds. It is a thrilling experience to climb onto a steep, rocky slope and discover treasure in the form of a large, beautifully colored elk shed lying on a bed of pine needles. You can hunt elk sheds for free in Utah, but if you want to collect them between Feb. 1 and April 15, you must first take the online orientation that is offered on the DWR’s website. To legally collect sheds you must have proof of certification during this time. The course makes you aware that elk are stressed during winter and their habitat is fragile and easily damaged. Any other time a certificate is not required, but for educational purposes, it is strongly recommended to take the course before shed hunting. Cow elk average about 500 pounds and stand 4 feet high at the shoulder and have no horns. When elk are born, they roughly weigh 35 pounds. Calves are spotted just like Bambi when they are young. During the mating season, which is referred to as the rut, bull elk are vocal as they loudly bugle to announce their presence to other bulls in the area, as a warning, and as an advertisement to cows. This noise is something that you will never forget if you hear it in the wild. Hardware Ranch in Blacksmith Fork Canyon 15 miles east of Hyrum is a great place to visit elk up close during winter. Due to human settlement on historic elk winter range in the Cache Valley, elk herds had no place to go during winter and became a serious nuisance to property owners. To defuse the situation and take care of the animals, the DWR started a supplementary feeding program at Hardware Ranch to prevent them from traveling down into the valley. This arrangement created a unique opportunity for people to observe elk during winter. The ranch has a modern visitor’s center with information on wildlife and elk. In the main room there is a large elk display and tall windows so you can look out and see the herd. You can purchase tickets for a horse-drawn wagon ride that takes you into the middle of the herd and stops so you can observe them up close. Tickets cost approximately $5 for adults and $3 for children. Take cash because Hardware Ranch is remote and credit card machines sometimes break down. If you go there I recommend arriving around 11 a.m. so you can take advantage of radiant heat from the sun while you stand in line and participate in the ride. Other than restrooms, there are no services at the ranch. I recommend that you bring snacks, a filled thermos and extra warm clothes. Before you go, especially if you have children, visit the Rocky Mountain Elk Foundation website and download the free “Elk: Exploring Elk Habits and Habitat” PDF. This document is written for children but I found it to be informative for anyone. For directions and more information on Hardware Ranch, see the contact information below. Our family had a wonderful time visiting these animals. Hopefully next time you encounter them along the highway, or in the mountains of Tooele County, you will have more appreciation for these amazing creatures. Hardware Ranch may be reached at 435-753-6206, 435-753-6168 or wildlife.utah.gov/hardwareranch. The information from the Rocky Mountain Elk Foundation is available at www.rmef.org/ElkFacts.aspx. 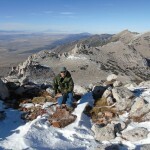 To take the DWR’s orientation course on hunting sheds, visit wildlife.utah.gov.